How to send a blank message and empty Status in WhatsApp. WhatsApp is undoubtedly the most popular messaging app on the planet, however, it gets boring when you see the same greetings, “KKK”, “hmmm” over and over again. If you really wanted to send any crazy messages to your friends, just crush your idea, because WhatsApp doesn’t have any crazy messaging features. However, there is a little-hidden trick which you can showcase to amaze your friends i.e sending an empty message. WhatsApp doesn’t allow you to send an empty message, but we will show you how to do that. WhatsApp doesn’t support some characters. Sending those characters will produce empty space. Taking this as an advantage we can send empty messages. choose the conversation to send an empty message. Paste it into your conversation and remove the arrow mark. That little dot does the trick. That’s it. A blank WhatsApp message will be sent. This feature might not work in future if WhatsApp supports this character in the future. Please let me know via comments if this method didn’t help you. This method involves a third party application called NoWord. 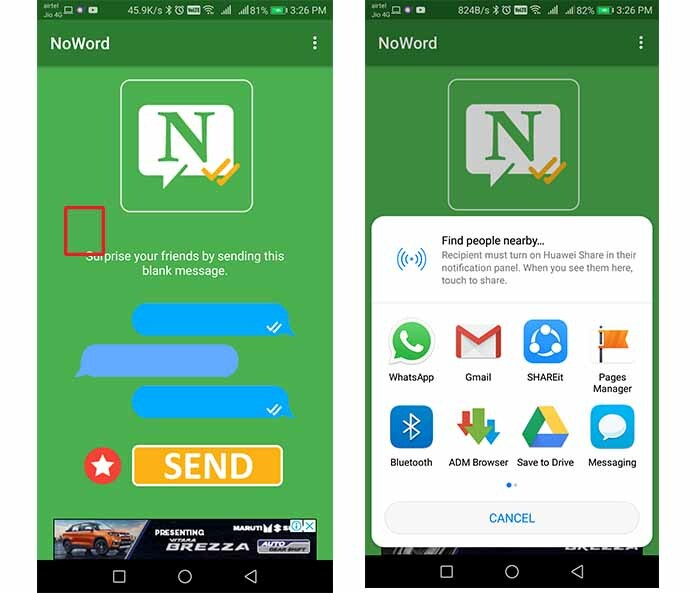 This is a really simple application which lets you send empty messages in any messaging app. Download the app from this link. That’s it. An empty string will be sent. You can also use this method to set an empty status. We hope this post helps you. If not, please let us know via the comment section below. If you wanna know any other tricks or tips, please let us know. Thank you.